Taralli are a toroidal Italian snack foods, common all over the southern half of the Italian Peninsula. 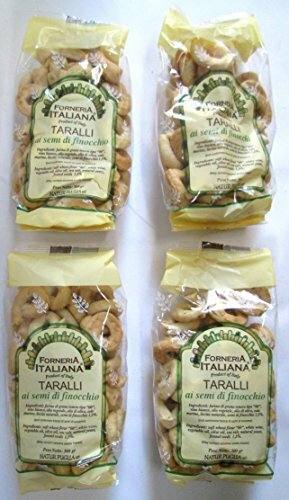 An oven baked product, a cracker similar in texture to a breadstick or a pretzel, Taralli by Forneria Italiana, perfect to bring them with you to school, at work and anywhere you want! Store in a cool and dry place, not in the refrigerator. If you have any questions about this product by Forneria Italiana, contact us by completing and submitting the form below. If you are looking for a specif part number, please include it with your message. Lombardi's - Homemade Italian Taralli with GARLIC, (2)- 16 oz. Pkgs.